The kit was new in 2010 and is in good condition. The original total list price for the items was over £1,800. The HTL-1000 High Temperature Submersible Logger is designed for use in tough, high temperature environments where there is a requirement for accurate and reliable temperature data. The logger itself is encased in 303 stainless steel to protect the electronics from damage. The logger can be set to record data at any user defined period from 1 second to 18 hours, and can hold up to 8172 records. The logger is programmed and downloaded via high speed serial communications and the Windows software. This software allows swift analysis of the data, providing graphical views, summaries and text views, as well as exporting the data to CSV format. Old stock clearance. Will no longer be available from TMS after current stock is sold. A single-phase solid state relay, for loads up to 20 amps. They are designed to be mounted on metal panel walls or other heatsink in order to keep the temperature of the metal base below 40°C. The control signal terminals are detachable for easy wiring. 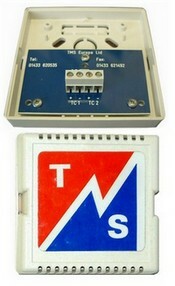 A single-phase solid state relay, for loads up to 50 amps, depending on model. They are designed to be mounted on metal panel walls or other heatsink in order to keep the temperature of the metal base below 40°C. The control signal terminals are detachable for easy wiring. Prices reduced to clear, while stocks. Wall Mounted thermocouple Air Temperature Sensor, with two thermocouple sensors for duplex measurements. Base 84mm x 84mm, 36mm height. Flame retardant white plastic case. Portable digital thermometer with large LCD display in °C or °F and cold junction compensation. Excess stock clearance. Special price for this unit only. 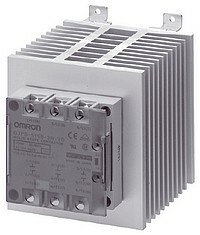 An Omron 3 phase (2 pole) solid state relay with heat sink for panel mounting. Controlled from a low voltage dc logic (on/off) input. There are 3 poles on the SSR, but only 2 are controlled so one is always conducting, they are therefore only suitable for delta or star-without-neutral load configurations. Contactor 3-pole, 35A (AC-1 non-inductive Load Rating), Contact Voltage: 440Vac, Coil voltage: 24Vac. Contactor 3-pole, 55A (AC-1 non-inductive Load Rating), Contact Voltage: 440Vac, Coil voltage: 24Vac. Contactor 3-pole, 90A (AC-1 non-inductive Load Rating), Contact Voltage: 440Vac, Coil voltage: 24Vac. The C360 Profile Controller has advanced ramp/soak profiling to make the operation as simple and as easy as possible for the operator. A dedicated display shows, at a glance, set point, process variable, current program/segment and time remaining in that segment. Three LEDs indicate the direction of the segment, either ramping up/down or in a soak, while the profile is running. To give a simplified operator interface, specialized buttons have been included to Run/Hold or Stop the profile and to increase or decrease the time remaining in the current segment. Special features include guaranteed ramp/soak, self-seeking set point, four time events (which can be allocated to relays as common events), maths, alarm and interlocking logic as well as cascade control for complex applications. The C360 has a NEMA4X/IP66 front face making it ideal for use in the harshest of environments. Dedicated for ramp/soak profile applications - Easy to use and follow customized display with direct control of the profile. Simple selection of multi-segment profiles - 99 segments and 20 profiles, configurable via the PC Configurator or front facia. Clear multicolour display with fingertip adjustment - Displays current program/segment, set point, time remaining and profile status. Automatic operation with manual override - Dedicated switches to Run/Hold or Stop and selection of profiles. Comprehensive input/output capabilities - Three analog inputs, two analog outputs, up to four relays and four digital inputs, plus RS485 Modbus for total flexibility. Guaranteed ramp/soak with individual hysteresis - Ensuring product quality, whatever the process conditions. Self-seeking set point function - Save process startup time, reduce costs. Easy-clean NEMA4X/IP66 front face - Ideal for hose-down and harsh applications. The C505 is an advanced multi-role controller with the capability of handling single loop and cascade applications. The instrument can be commissioned in minutes using a built-in library of application templates and advanced autotune facilities. Configurations can also be edited and stored off-line using our Windows-based PC Configurator. A wide range of process connections is included in the standard instrument. IP66 (NEMA 4X) front panel protection makes the C505 an extremely robust controller, suitable for use in a wide variety of industrial environments. Clear process display and color-coordinated switches allow clear process visibility and ease of operation. Comprehensive input/output capabilities with up to three analog inputs, two analog outputs, four relays and four digital inputs. PC configuration for ease of setup, easy access to advanced features and standard settings. IP66/NEMA4X front face ensures reliability in the harshest environments. 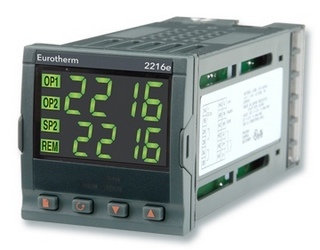 The OMRON E5GN is a 1/32nd DIN compact and intelligent general-purpose controller. A IP66 rated front panel cover to protect an Omron controller. Old stock clearance.